The portable Lighted Lap Desk is meant to use almost anywhere - on a plane, on the train, or in bed. Covered in a soft foam microfiber base, you can rest your notetaker, laptop and mouse on it to work, or you can use it to write on when you don't have a surface near you. 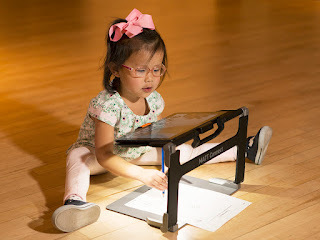 The Lap Desk also has a built-in cup holder, a convenient lamp, and it also flips open to reveal a built-in storage area for accessories. Featuring a bright gooseneck lamp, plush leg rest, smooth desktop surface, and plenty of storage space, it's a great go-anywhere portable desk. The flip-top design latches securely and the powerful cold cathode fluorescent bulb automatically turns on when lifted. The built-in cup holder turns your portable desk into a relaxation center! Lap writing desk measures 23 1/2" x 5 3/8" x 17 3/8" and the storage Approximately 18 1/2" x 11 1/2". Lamp uses four D batteries (not included).